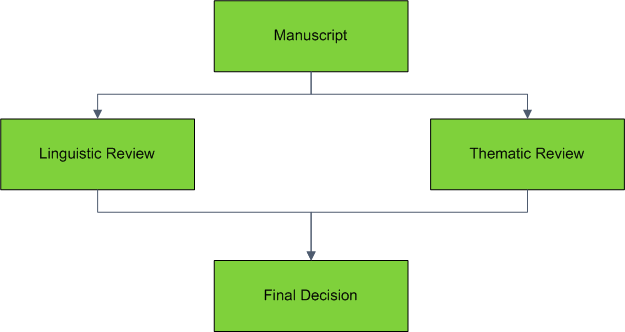 All manuscript will be assigned to more than one reviewer through 5 steps. As soon as we receive an article, the Editorial office will Pre-Review your manuscript in one week. The officer will check whether the manuscript is valid and language is fluent and necessary factors are all included. The officer will also cross check the article in crossref database in order to avoid plagirsm. The following is a formal review process accomplished by other official reviewers for one month. It is decided by Editor-in-Chief in one week whether your manuscript is accepted or not. All submitted papers will be reviewed in about six weeks. 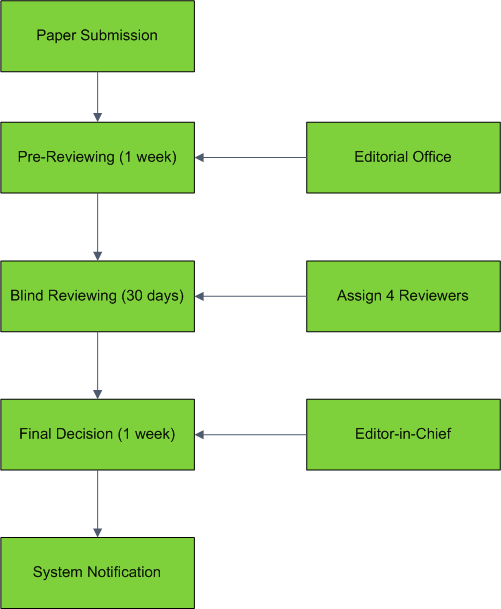 This journal follows blind reviewing process, where both the referee and author remain anonymous throughout the process. Each article submitted to us will be reviewed by at least 2 reviewers. Moreover the papers will be checked for linguistic consistency. Thematic review will decide whether to accept or reject according to the originality, significance for theory and practice, quality of content and presentation of submitted paper.